The long-awaited eastern span will be open for business once the work is complete. Crews are working overtime to get everything ready for a Labor Day event that will effect tens if not hundreds of thousands of people. No, not Burning Man, you hippy. 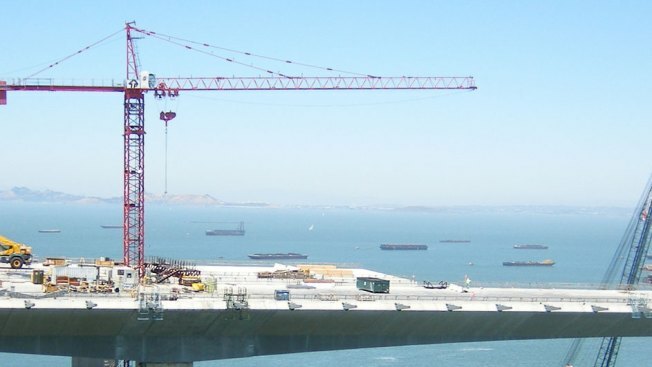 The Bay Bridge renovation requires that the section of I-80 connecting San Francisco to Oaklandwill be closed for the holiday weekend. The closure, announced months ago, will be four days long, from Friday through the Monday holiday. A chunk of the current bridge needs be cut out, and a new section added so that traffic can be detoured onto the new span and the old span can be demolished. It's a high-wire act involving thousands of tons and mere inches of clearance -- and high winds could upset the plans. If the weather doesn't cooperate, the work will be moved to the following weekend. If that happens the closure becomes a whole new thing. September 11 -14 is a regular late summer/early fall weekend and people will be working on the Friday and the Monday. Even on a holiday weekend, no access to the Bay Bridge will be a big inconveniece. Push that forward a week and that "big" could quickly turn to HUGE. Jackson West only cares about the BART tunnel, but wishes the workers luck regardless.